Formerly named as Nexus Launcher, the new Pixel Launcher APK 7.1.1-3368800 is now available. When it’s seen on surface, this app has some similarity with Nexus Launcher. However, there are some differences as well such as the new version number and icon. Moreover, it also comes with new integration with Google Calendar icon. 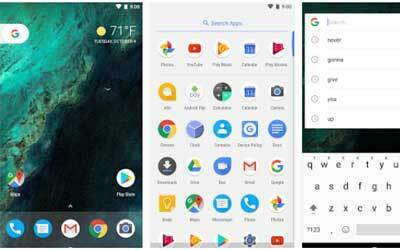 The launching of this application has made most people feel certain that Pixel and Pixel XL will be the name of the new Google’s smartphone. It can provide great home screen experience. The main features of this screen application are claimed to be superior and functional. For a start, it brings you personalized and news information at the right time only through swiping from home screen. It allows you to enjoy quick access to Google Search on device’s home screen. Easily find any applications inside your device by swiping up on the bottom of the Favorites row. There is also the new App Suggestion feature to bring applications that you have been looking for. Once you have found the app, you can drag them easily to home screen by long-pressing on shortcuts. To enjoy this home screen experience, you need to download the APK. Then, you can install it through the file manager. The installation is very easy and you can soon enjoy the great experience right away. If you find trouble during installation, the best thing to do is re-download the file. Make sure the file is complete. Then, repeat the installation. It only takes a few minutes, so you should be rest assured. Once you are done, the Pixel Launcher for Android will give you the most seamless experience. Swipe right from your home screen to see personalized Google cards that bring you news and personalized information, at just the right time. Quick access to Google Search on your primary home screen. Swipe up on the bottom Favorites row to find your apps from A-Z. Long-press on apps that support shortcuts to jump right into where you need to go or long-press on the shortcuts to drag them to the home screen. This is the best launcher. Pixel is a great phone and this launcher makes it even better. Google Assistant is easily accessible, app tray is accessed by a simple swipe up, and it’s fluid and without lag.